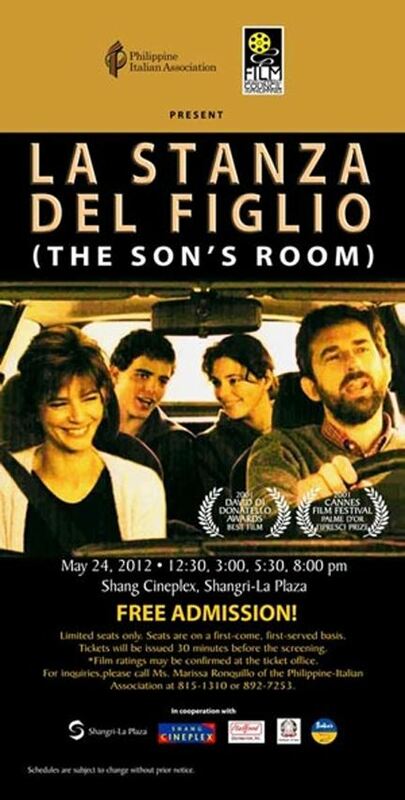 Philippine-Italian Association and Film Development Council of the Philippines present La Stanza del Figlio (The Son's Room, 2001) by Nanni Moretti. La Stanza del Figlio, starred Nanni Moretti, Laura Morante, Stefano Accorsi, & Silvia Orlando. It will be shown for FREE at the Shang Cineplex on May 24, 2012 at different time slots - 12:30pm, 3:00pm, 5:30pm, 8:00pm, but on a first-come-first-served basis. The cinema is located inside Shangri-La Mall in Mandaluyong City. Giovanni Sermonetti is a psychoanalyst who lives in Ancona with his wife, Paola (Laura Morante) and two adolescent children (Jasmine Trinca and Giuseppe Sanfelice). He loves his work, his life and his family and is shocked when he learns his son and a school friend stole a precious fossil.